Jaipur, Seventeen of the 23 members of Rajasthan Chief Minister Ashok Gehlot’s expanded council of ministers are first-time ministers, sources in the Congress said Monday. The 23 ministers, including one from Congress ally Rashtriya Lok Dal, were sworn in at the Raj Bhavan here. Of the total, 13 are cabinet ministers and 10 ministers of state. 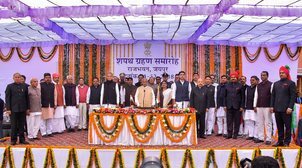 They were administered the oath of office by Rajasthan Governor Kalyan Singh and the swearing-in ceremony was attended by Gehlot, Deputy Chief Minister Sachin Pilot and other Congress leaders. Sources said those Congress MLAs, who emerged winners in the 2013 Rajasthan assembly elections despite the “Modi-wave”, were also given ministerial berths. They include Ramesh Meena, Govind Dotasara, Bhanwar Singh Bhati, Sukhram Vishnoi, Ashok Chandna and Rajendra Yadav, who are also first-time ministers, the sources said. Of the 17 first-time ministers, seven are cabinet minister and 10 minister of state, they said. Some of the prominent names who held ministerial portfolios in the previous Congress government in the state, but were not made ministers this time are C P Joshi, Hemaram Chaudhary, Deependra Singh Shekhawat, Parasram Mordia and Rajendra Pareek, the sources said. They said Ashok Bairwa, Mahesh Joshi, Jitendra Singh, Mahendra Singh Malviya, Brijendra Singh Ola and Raj Kumar Sharma were also not given chance in the state cabinet of this Congress government. The names of council of ministers were finalised by state Congress leaders, including Gehlot and Pilot, after rounds of discussion with party president Rahul Gandhi and other senior leaders, the sources said.